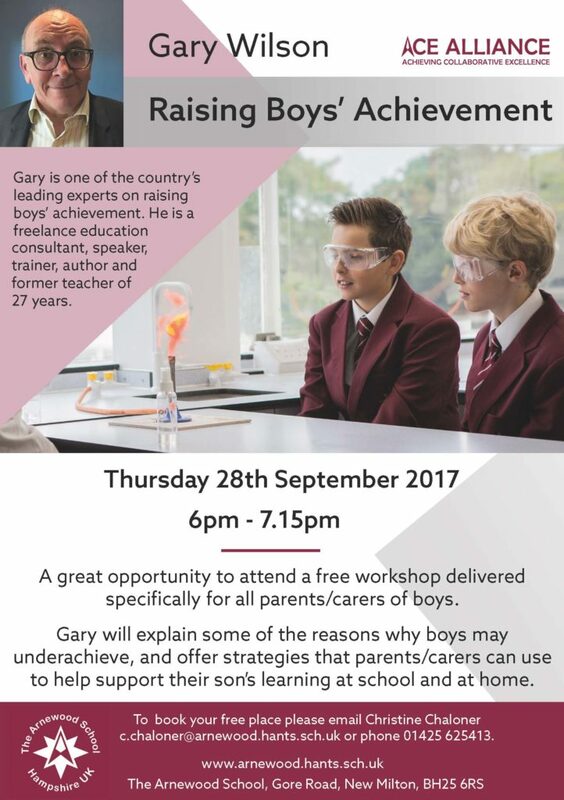 The Arnewood School is pleased to offer this free workshop for parents/carers of boys on Thursday 28th September 2017. Gary Wilson is one of the country’s leading experts on raising boys’ achievement. He is a freelance education consultant, speaker, trainer, author and former teacher of 27 years. His workshop is a great way to understand some of the reasons why boys may underachieve and learn the strategies that parents/carers can use to help support their son’s learning at school and at home. Please book your place on this workshop with Christine Chaloner by email: c.chaloner@arnewood.hants.sch.uk or phone 01425 625413.